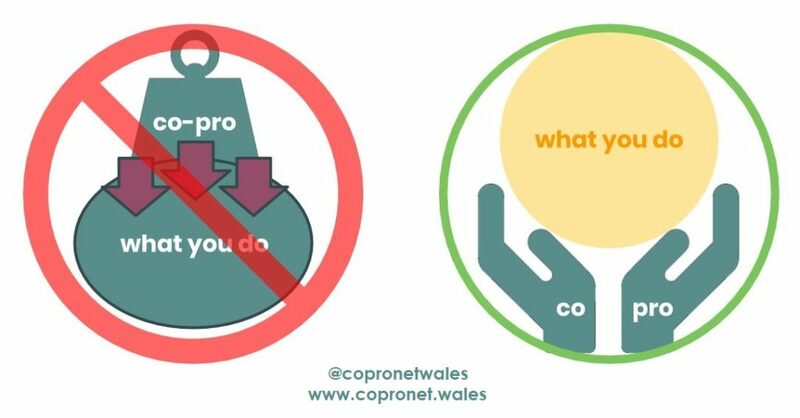 (From Noreen:) These are diagrams that I use when I do presentations and workshops about co-production, in case they come in useful for you too! When and when note to use co-production? Co-production is absolutely the right thing to address complex/wicked problems, but not simple or complicated ones that are linear and have predictable outcomes. (And we’re not talking here about emergency situations.) For more on this check out complexity theory (there are some links in this knowledge base that are a start). This is like the ladder of participation, turned on its side. The ladder sort of implies that everyone should be aspiring to co-production all of the time with everyone, but actually a) like in the complexity theory diagram above co-production is perfect for some kinds of challenges and b) you have to meet people where they are. In a co-production approach sometimes it’s the right thing to do to or for depending on the capacity of the people involved, and sometimes you scaffold people and bring them along and work with them, and their life changes and they may fall back to for or to – and that’s ok. It’s most important to have the wisdom to do the right thing at the right time, a proportionate and appropriate response. But don’t take over and control more than you need, or make decisions that work for the system and not for the people who are in it. 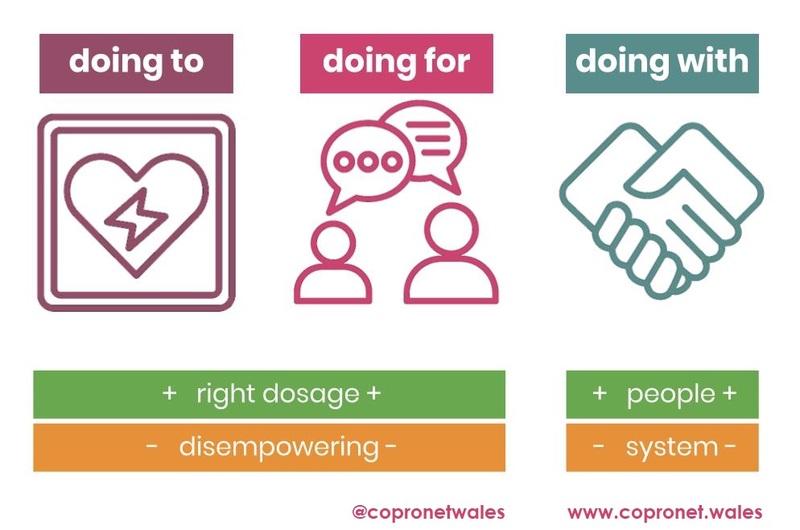 This is a really handy diagram to highlight the difference between outputs (can usually be measured and counted easily) and outcomes (the difference they make to people’s lives). For example a fantastic triple chocolate cake could be a terrible outcome if the person it’s for is gluten and dairy intolerant! And to find out what a good outcome is you need to ask the person it is for. Co-production isn’t something else that you have to do on top of what you normally do. It’s how you do what you do.